Recycled bikes now mark the Tour de France route. A yellow route reminder on Harrogate Road. The Meanwood Urban Valley Farm bike project leave their mark on the bike as well as the route along Scott Hall Road. 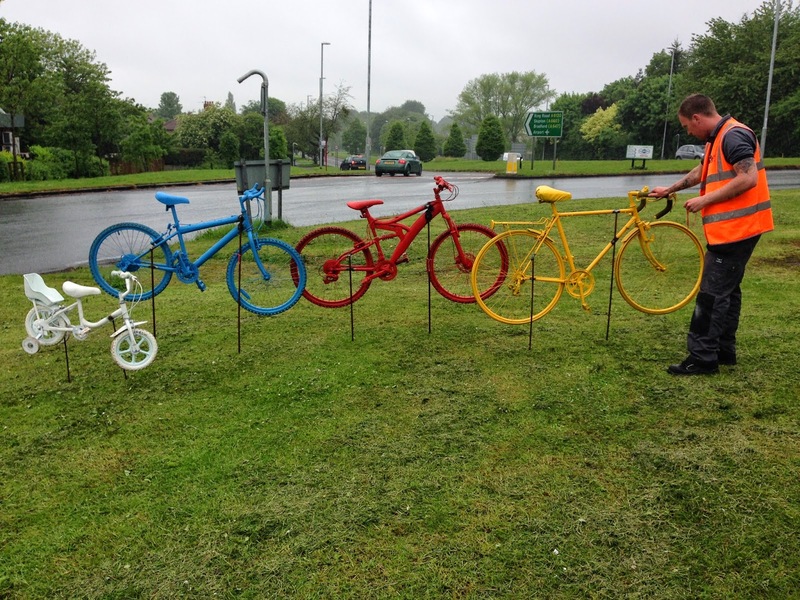 Local groups are leaving their mark on the Tour de France route with specially painted bikes. 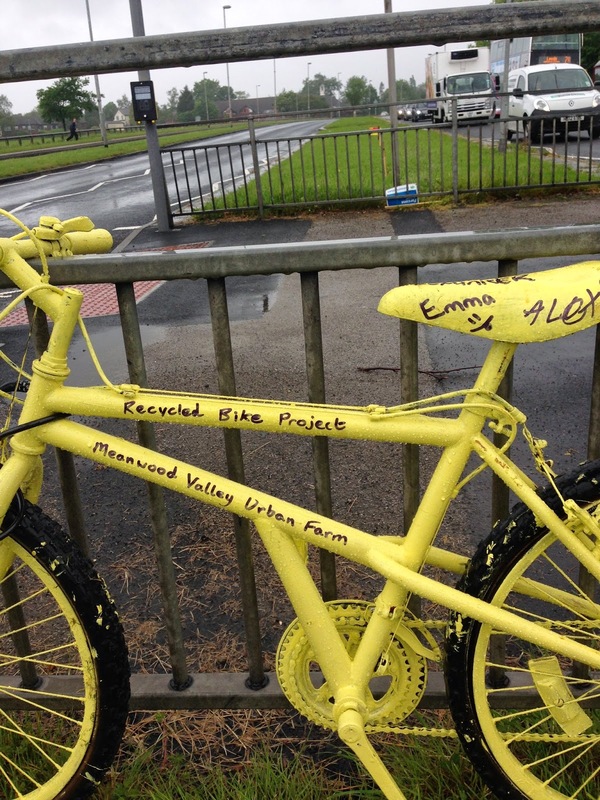 Young people and volunteers from the Meanwood Valley Urban Farm Bike Project, Opportunities Inspiring Learning (OIL) and Pedallers’ Arms Bike Co-op have so far taken over 40 unwanted bikes and prepared and spray painted them yellow. 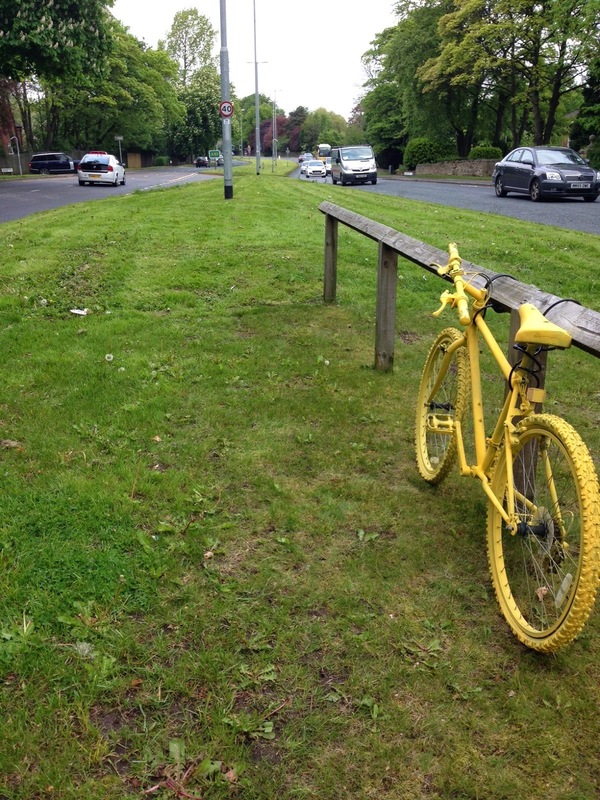 The bikes can now be found along the Tour de France route as it winds its way outside the city centre to Otley. The project complements the hard work of the Otley in Bloom group who have placed yellow bikes adorned with flower-filled baskets throughout the town. As well as the difficult-to-miss yellow bikes, some have been painted red, white or blue and placed on roundabouts. The groups are continuing to prepare more bikes as they are donated with these appearing on the route soon. Some bikes have come from the council’s recycling centres while others have come from council staff, Royal Mail and the groups themselves. With around 7,200 bikes left at the council’s recycling centres each year, the groups involved play an important part in reducing this waste. The bike project at Meanwood Urban Valley Farm helps young people learn mechanical skills by rebuilding old bikes which they donate to others or use themselves. Young people attending workshops run by OIL – a not for profit training centre – get to use bikes they’ve refurbished themselves that would otherwise go to waste. OIL also run courses for young people and adults so they can gain accredited mechanics qualifications. Local people can learn how to repair and maintain their own bikes from the friendly support found at the Pedallers’ Arms Bike Co-op. As a very visual reminder of the route riders will take through Leeds on 5 July, it’s hoped that the bikes will also make people think about how their old or unwanted bikes could be re-used by others. “Being able to say you were involved in the Tour de France is a once in a lifetime opportunity. We’d like to thank all of the groups for playing their part in helping us really bring the route to life as we know people have had great fun spotting the bikes as they appear. “There is a serious side to the bikes though; we hope they’ll act as a prompt for road users, local residents and businesses to familiarise themselves with road closures and plan their viewing point and travel arrangements for the day accordingly. If friends, relatives or neighbours can’t re-use your old bike, you can consider helping the environment and someone else by selling it or passing it on online. Alternatively, you can leave old, unwanted bikes at the re-use containers at the city’s recycling centres for collection and repair by local charities. Any that are beyond repair are recycled. Bikes left at the council’s facilities are also re-used by local organisations helping people gain skills and get into employment as well as a mode of transport for their new job. After the Tour de France, the council hopes to donate the colourful bikes to local schools, community organisations and parish councils while others may remain in place. Information on re-using and recycling can be found on the council’s website. Full details of the road closures and travel arrangements for the Tour de France can be found the Grand Départ Leeds website.